Two subjects | Where's my backpack? I’ve taken many photos of the Statue of Liberty – from Battery Park, from the Staten Island Ferry, from an airplane making its descent into New York – but have never really been happy with any of them. They all ended up as just another picture of a statue. 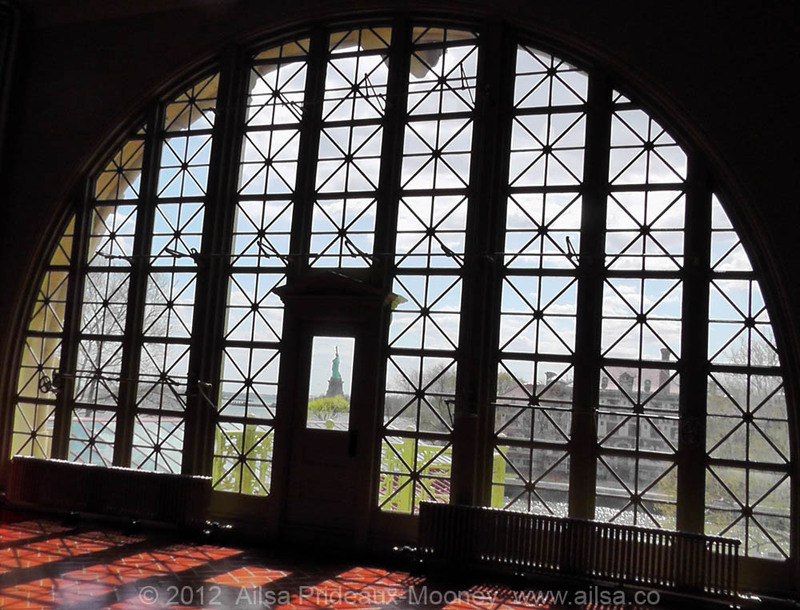 But when I visited Ellis Island for the first time recently, I was wandering around The Registry Room aka the Great Hall and my eye was caught by sun spilling through the beautiful arching windows. As I went to take a photograph, I noticed the Statue of Liberty visible through the pane of glass in the door. At last, some context for the iconic statue. I cannot imagine what it must have been like awaiting processing in this hall all those years ago, catching a glimpse of Lady Liberty and not knowing if you were going to be allowed to stay, or worse, knowing that you were going to be deported. So close, and yet so far. This entry was posted in New York, Photography, Travel, United States and tagged architecture, history, photography, photos, pictures, postaday, travel. Bookmark the permalink. Thanks Niki 🙂 I see you’re from Edinburgh, lovely place, I fell in love with it when I visited. Those deep fried Mars bars are dangerous, though! Ha! Yes, we are lucky here in Edinburgh, its pretty special. The deep fried mars bars are a ‘treat’ we keep only for visitors!!!! This is soooo nice 🙂 Love it! Wow, now that is an amazing composition. Thanks Anne. Ellis Island is a fascinating place to visit, but this particular image really brought the immigrant experience to life for me. This is more than a photo, this is the true feeling. It really touched me! Thanks a lot! Yes, all of that and more. It always surprises me how a single image can have such resonance, but the minute I glimpsed the statue through the window, my mind was flooded with visions of immigrants lined up to be processed, weary adults full of fears and apprehension, kiddies pressing their noses up against the panes to glimpse this land of opportunity they might one day call home. Got me a little choked up, don’t mind admitting. Thanks phil, the windows in the Registry Hall are stunning, wonderful architecture all round. Thanks Heather, so glad you commented on mine so I could find yours. Reflections of Trump Tower is wonderful and I love Bumblebee Cafeteria!